money. Happiness is forgotten; the means are taken for the end." One of the greatest actors of our time (who cannot possibly be short of a buck or two, surely?) can now be found playing golf on a piano advertising Sky Broadband for Murdoch... Disbelieving heads bow. Are we undone? Are we lost? 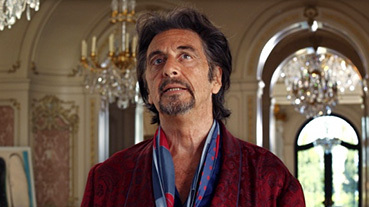 Why, Al Pacino, why? Was he (ahem) made an offer he couldn't refuse? Executives and commissioners who still have a well-spring of cash in these illusorily moolah-strapped times can tempt like never before. Money, of course, isn't money in Hollywood. It's power. Even I know that. After becoming a billionaire in Ben Elton's first novel Stark, businessman Sly Moorcock is invited to a very exclusive dinner at which the unspeakably rich are expected to order whatever they can dream up (because money can make anything possible). Playing the nouveau-minted to the hilt, Moorcock orders swan. Duly delivered and devoured, he complains that it might as well have been cat as that was what it tasted like. Of course only the chef knows it actually was cat. It's amusing but it's also making a good point. We have only one mouth, one tongue but some of us have a singular ambition to have more and more because absurdly rich people can simply afford to be that profligate, that obscene. It's the dog's testicle joke writ with gold-leaf. Of course, a bravo and applause must go to those who use their vast wealth to increase the good on this planet. And if Pacino donated what must have been his hefty fee under the cover of no publicity to a charity homing abandoned dogs then OK, I'll buy the apparent Corleonic humiliation if not the actual product being hawked. pleasant offshoot, nothing more. His pleasure comes from ours. It's a shame that Steven himself cannot see 'E.T.' for a 'first' time." That quote is an excerpt from a letter written by a naïve and keen movie nut still young enough to be overawed by Spielbergian charm (and both the writer's name and DNA were curiously the same as mine). I may have been an innocent and trusting 21 year-old when I wrote that (and of course thrilled that the magazine devoted an entire half page to my earnest outpouring) but even to my older 2013's eyes, it still holds true. In the part (the small part) of my mind that's not been corrupted by the drip feed of finding out what people are really like (a pitfall of the onset of maturity) there used to live the idea that honour and artistic integrity existed in Hollywood. OK, that's enough violent guffawing. But there was no ET 2 – Eliot's Journey, was there? 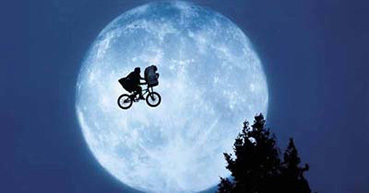 If ever millions were to be made from a tantalising machine stuck on three cherries, it was a sequel to ET. And yet for all his 80s integrity, Spielberg now puts his name to Michael Bay's anti-cinematic Transformers movies... Odd that I should start this article on the day that both Spielberg and Lucas predicted a 'meltdown' for the Hollywood Blockbuster while speaking about the state of the art at the University of Southern California. Curious. And curiouser. "If only we lived in Cars!" In your early career, even the great (and recently both lauded and re-married) George Lucas didn't see the potential in your talking lamps and ever so oddly rendered babies. It took a risk-taking visionary to get you what you needed to soar. Steve Jobs valued you and your extraordinarily talented colleagues to the tune of 10 million (this now seems like small change. In 2006, Disney did the same thing but it cost the Mouse House 7.4 billion dollars, twenty years later, whoa...) You made us care time and time again while Disney gnashed its teeth, pointed at you and your company's emotionally resonant and technically jaw dropping work and said "How do you do that? Why can't we do that?" Or perhaps more pointedly "Why can't we do that anymore?" Once Disney had consumed you and put you in creative charge of the entire company's movie division, something changed. It's been a subtle shift, like getting the managing director of Apple to oversee Dell at the same time. Can you make Dell more Appley or is the effect to dull Apple's image and make it more Delly? I'm sure you think about this weird split in your professional duties every day you travel to work. You were forced into playing a little dirtier than usual and for a few months, perhaps a year, your great creative instincts and intellect underlined and consolidated Disney's more glittering past. You appeared to have made nostalgia-based justifications about the Mouse House's current resident lawyers and bean counters. You appeared to will yourself to believe that it was as if the folks at Disney had always been benign purveyors of superior children's entertainment and nothing more. Alas, new Kings do not bend their knees to old Kings, no matter how many hearts the old King enchanted a long time ago in a galaxy far, far away. But you did. I might have genuflected too if I took Pinocchio, Fantasia and The Jungle Book into account. But the operative word in that wonderful roll call is 'account'. You wanted Disney 2006 to still be Disney 1940. And, a month after the Disney/Pixar deal was finalized, Cars was released and something absolutely extraordinary happened... (under the hood and everyone's radar as it were). Is anyone familiar with Britt Allcroft? If you are parents of one or more boys or train-loving girls, you probably are. She's a tremendously successful entrepreneur/TV producer who was able to get hold of the rights to the Reverend Wilbert Awdrey's 'The Railway Stories' and make them into a long running children's series and a merchandising behemoth. 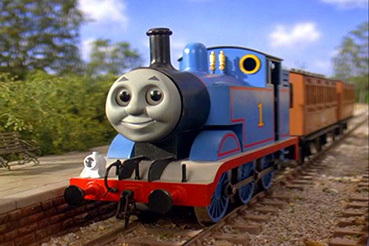 If you're scratching your head, let's rename the franchise to make recognition easier; "Thomas The Tank Engine". Thomas and his friends have roundly assaulted most parents' bank accounts. Allcroft's goals may have been modest at first but she still managed to snag Ringo Starr to perform the voiceover of the first series of live action model adventures – and to star in the US TV version. For younger readers, Ringo was one of the Beatles, a pop group famous in... oh, come on. 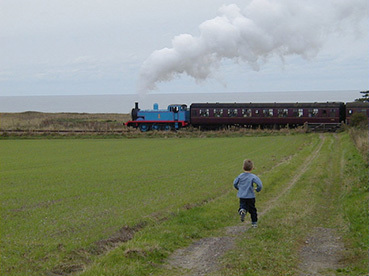 But as the demand for the toys soared, Thomas became international (with its US sister show 'Shining Time Station' snagging the infants from birth). My son had so many iterations of the merchandise, it was all we could do to avoid christening the house 'Island Of Sodor'. If you ever want to get entrepreneurs a Christmas present, get them a format with infinite growth potential. Allcroft could, if she chose – and she chose with some regularity – to expand her range of toy characters by dipping into the back catalogue or creating her own. Original author Awdrey died twenty years ago so we have no way of knowing how he'd feel about these possibly profit-led additions to his originals. His son, for whom the stories were written, carried on the Thomas literary tradition but fell by the creative wayside when the TV programme became more commercially persuasive and viable over the lavishly illustrated books. John, you said in an interview about Pixar's least well reviewed film, Cars: "The toy sales have actually gone up every year since the movie came out, and that's all over the world. The products are really a manifestation of the love of those characters and are a way that collectors, kids, families, can have the characters be with them beyond the boundary of the film." OK, I get that but there's something else at play here, something that really defines the company whose maw you now sit in. Yes, kids love the toys if the time my own son played with Thomas and company was anything to go by. He was the Fat Controller of his own Thomas universe. 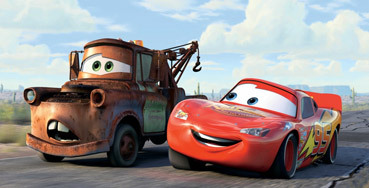 The extraordinary fact, as reported by Disney was that in the five years since its 2006 release, Cars has generated global retail sales approaching $10 billion. You may not need to read that again but I had to. That's a 'b' not an 'm'. So not only was the production of Cars 2 a no-brainer (what a surprise the cars went all over the world in the sequel, where most profits are now generated), Disney and yourself were almost dollar-bound to come up with another Cars-like cash cow. But was Pixar involved at all in the squirmingly profit driven exercise that is Planes, out this month? It's a cookie cutter exercise (and boy, are those behind the scenes interviews going to have to feature well prepared stories about why this avionic tale just had to be told...). It couldn't have anything to do with the $10 billion worth of potential merchandising, could it? 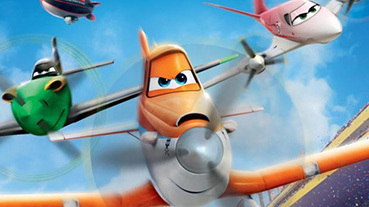 Planes is coming soon to a cinema and toy shop near you (without the official Pixar stamp – it's a Disney Toons production – but with all the Pixar style). When Buzz Lightyears and Woodys flew off the shelves after the enormous success of all three Toy Storys, I couldn't be happier. It was an extension of something loved that was based on a story-telling passion, something that generated the desire for the toy. Now, we seem to be at a point when the point is the toys, the tail wagging the Slinky. Or has it always been this way and am I just too damn naïve and trusting in an artist's integrity? John, you may be being honest in your press release in which we learn that Planes is so good it's been upgraded to a theatrical release from a direct to video effort. But this does smack of blatant profiteering. Yes, you can throw off any responsibility on to CEO Bob Iger's shoulders but as this movie is a sort-of sequel to Cars, didn't you have any say at all? With an apology for two terrible puns but John, I always hoped you believed that the art came before the purse. Now the dollar has dirtied Pixar (by association and not a lot but enough). With the sequel to Finding Nemo coming out in two years time and The Good Dinosaur in production, I sincerely hope these projects shower off the mud that's sticking to your extraordinary company. In most stories, a common morality is established and more often than not adhered to. To those fans of Game of Thrones, who hasn't imagined all sorts of gruesome ways for King Joffrey to bow out, the more painful and protracted the better? It's a testament to the richness of this character's awfulness that we care enough to hate him so vehemently. Storytellers understand this need for moralistic full stops on sloppy, unfair sentences. Life is unfair. It seems a little heartless but realistic for artists to underline this point, which is why fantasy and escapism are scoring big box office at the moment. Our leaders have told us we must all be good girls and boys because things are really difficult right now. So, heads bowed we shuffle in front of a screen to leave the world of debt, jihadi machete-death on the streets and gay-bashing Russian police behind and see what a man in an iron suit is up to on his fourth outing. It's almost beyond absurd but we all accept it because it's 'normal'. To quote Douglas Adams, "The fact that we live at the bottom of a deep gravity well, on the surface of a gas covered planet going around a nuclear fireball, ninety million miles away and think this to be normal is obviously some indication of how skewed our perspective tends to be." Well if our perspective is skewed, I can't imagine what shapes the high fliers at Disney must contort themselves into. The Executive in power is both egotistically different from 'normal people' but does his/her job with the implied assumption of knowing what normal people want. This is professional cognitive dissonance, a Winston Smithesque belief that 2 + 2 can equal both 4 and 5. I have no problem with great success flowing from great achievement. J.K. Rowling still finds herself stunned at the wealth she has amassed via Harry and friends but she does give herself credit for actually doing the work. If you write just over a million words in seven books and enchant an entire world, then success is all the sweeter but I am glad to say that Rowling is one of those afore mentioned philanthropists whose wealth works as a force for good in the world. Lassiter and Pixar also worked hard for their success. I hope that their pact with Disney doesn't poison their well. Money may make the world go around and while Disney still makes its acquisition its primary driving force, can Pixar move forward untainted by its business partner's ethos? "In a crowded summer for family animated features, Planes looks more like a well honed merchandising mill than a must-see picture..."
So it's not just me. Come back to us, John.